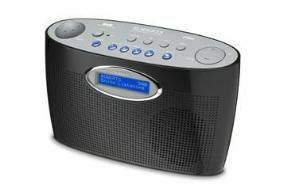 Roberts revamps portable DAB/FM radio range, starting with £50 Elise | What Hi-Fi? You also get a clear LCD display, easy-to-navigate menu and a large rotary volume control. Other features include a line out socket, heaphone jack, DC input and mains or battery operation. Auto search or manual tuning are both offered, and the Elise is available in white ot black with an 'ice blue' display.